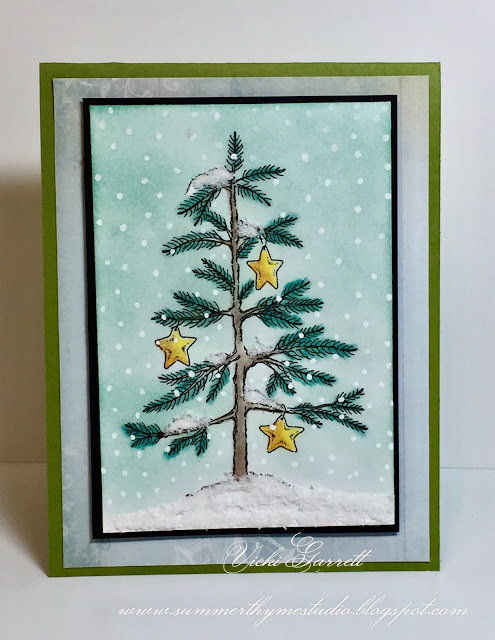 This is probably the first, maybe second time that you will have seen ATC's on my blog! I've never really been much into them until I joined Vera Lane Studio Digi Stamps Facebook Group. I first became acquainted with Janet Klein when I was designing for Stampotique Stamps. I've always loved her style and was so excited when she started to release digital images. I have managed to collect a few over the past year and thought I'd give the ATC card exchange a go! These are the two cards I created for the February and March trades!!! The March Theme was a mix up theme. You had to combine more than one set. I used three or four in this one I think!!!! I'm really excited to see what is on for April. It's not only fun to make them, but it's really exciting to get a card back in the mail! I'm here again with another episode of Festive Friday. Back to Christmas cards again this week. This one will NOT meet my minimum postage requirement, but I couldn't resist adding the little heart buttons to his belly. They are a touch crowded, but I like them. I should be able to hand deliver this one, so I can say it's even better than regulation mail. So here's the goods on this card. I started with the Snowman Window Scene die. I cut it out twice; once in White and once in Not quite Navy. Then I picked and chose which elements to leave white. I coloured the snowman with prism pencils and shaded him with Copic marker. Lastly, I added some glitter just because you KNOW I love me some pizzazle!!! I embossed the Red Panel with a Creative Expressions Star embossing folder. 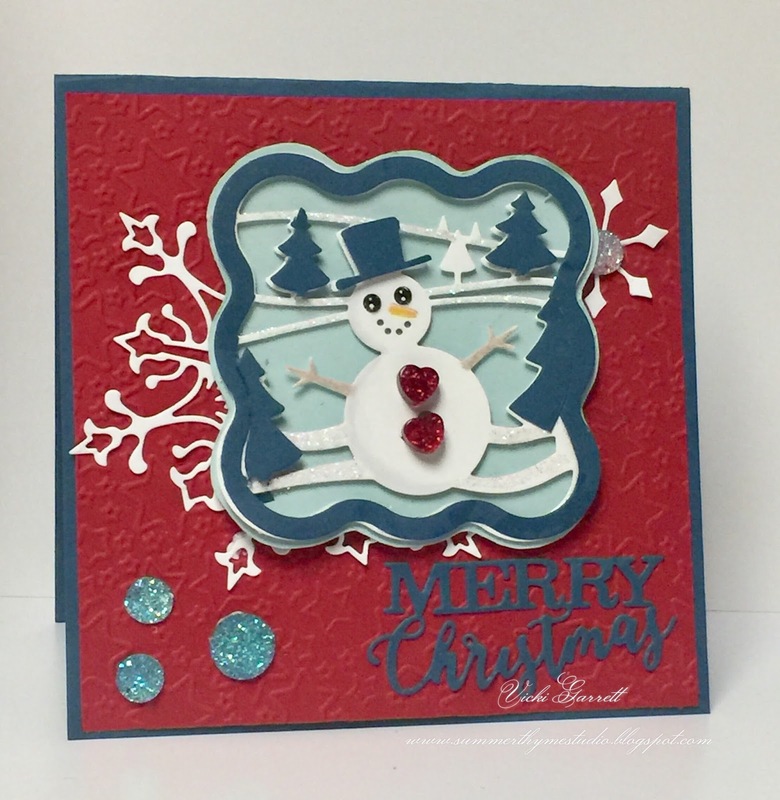 I added some sections of the Large Snowflake Die to fill in the background. I added the Merry Christmas Die. I love this die because the die actually says Merry Christmas and a Happy New Year. That way you can use it for Christmas, New Years or all in one!!! Great value for your $$$$$$. Finally I added some sparkly bling as a final touch! Since today is Festive Friday, I took a little break from Christmas Card creating to bring you this lucky little alligator. I didn't have a Leprechaun on hand, so I used this cute little Patchwork Gator to compliment the Shamrock and the Fancy Shamrock. Why on earth did I use the Alligator..... well, let me you. When I think of St, Paddy's day, I think of the Irish Rovers. Of course they are famous for "The Unicorn"
They sing of Green Alligators......so there you go! That's an Irish Alligator on my card! 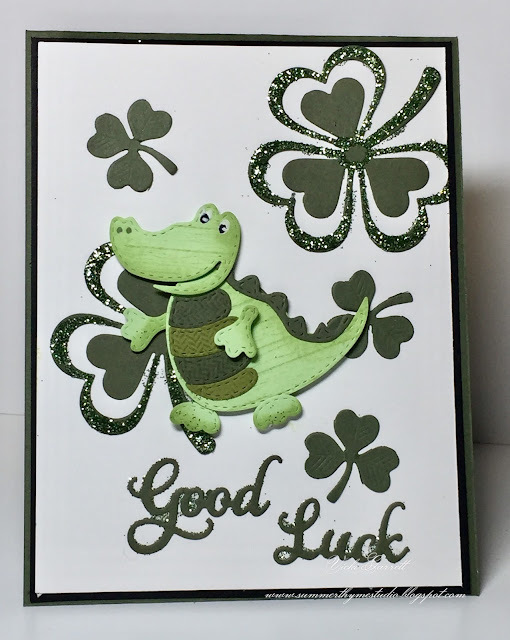 I added a little texture to my Green Alligator by stamping him with one of the mini patterns 7 stamp sets. Lastly, I glittered up the Shamrocks and added the Good Luck Die just for good measure!!!! We enjoyed a few pints and some "Craic" at Hayes Pub! While in Ireland, I searched for Leprechauns and Unicorns to no avail, but I did meet some lovely people and was blessed to enjoy the Irish Culture and Countryside. Good Morning! Welcome to the Impression Obsession Designer Challenge. I can't believe that it's Thursday already. Where DID this week go? I have two shares for you as I had two occasions to create some cards. A friend is a new Gma to a beautiful baby boy so blue was perfect for this nautical newborn greeting. 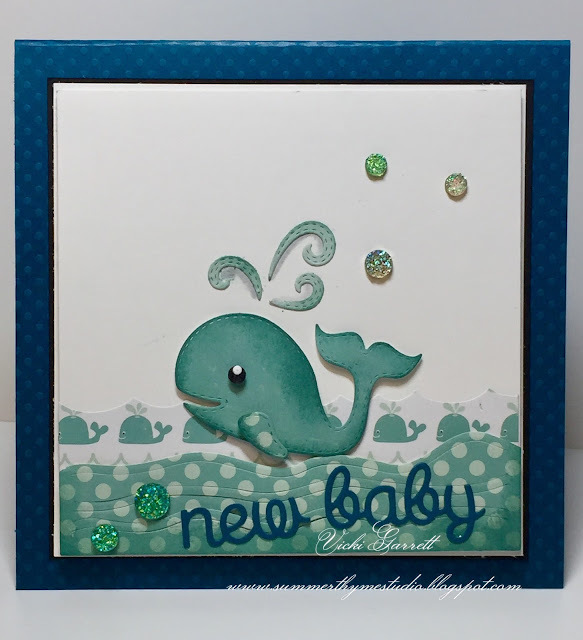 I teamed up the Patchwork Whale Die with some Echo park bundle of joy boy paper adding some waves and water using the Ocean Border Die and the wave adapt a background. I finished of the card by adding some sparkly gems to simulate water droplets. Lastly, I added the new baby sentiment using the Congrats sentiments die. Here's the IO supplies I used! I'm looking forward to seeing your blue cards! Here's my share for this week. In keeping with my guidelines of making quarter fold cards, I wasn't able to fit a sentiment on this card. I'll save all the good stuff for the middle!!!! I sponged around the tree with Soft Sky and Added Flower Soft Polar white for some dimension. Lastly, I added my trademark snow flakes with a Sharpie Paint Pen! Good Morning!!!! Sorry I'm a little late on the uptake, but I didn't have my publish setting accurate! 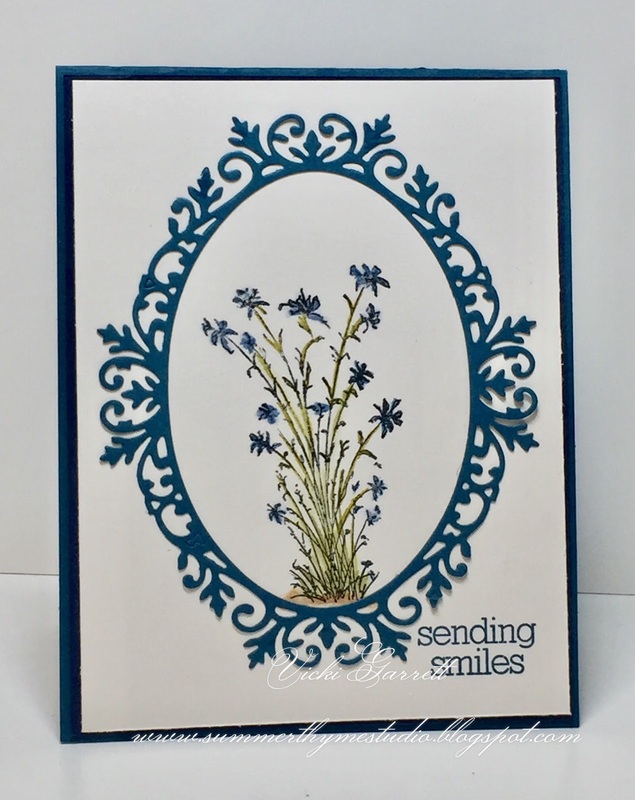 Here I am now with my Fun with Flowers Challenge card. I have to tell you that I am totally Inspired by my Fellow Team mate Ilina's use of colour on florals. So much, that she enabled me to purchase the Zig Clean Color Real Brush Markers. This was my first attempt at watercolouring flowers. I chose the flower from the Maya stamp set as it is a nice size, which is perfect for colour practice. I embossed the flower in white; a great idea when starting with watercolour to ensure you stay in the line! I had a lot of fun experimenting with different colours! Next time I watercolour, I'll keep track of the pens that I used and make note here for you. I really love the vibrancy of the markers. So much so, that I didn't want to cover up my "work of art: hehe! I decided to choose a fine die that I thought would enhance, rather than distract from the flowers!!!! I am excited to see what you all do this week! to see the Design Team creations, follow the links!